An unprecedented abuse of taxpayer dollars by the City of Brampton’s former top executives, who approved secretive non-union bonuses worth $1.25 million—including payments for “favouritism” that could have gone to themselves—has been revealed in an internal audit report. It’s unclear if council, which meets Tuesday to receive the audit committee report, will call for a criminal investigation into the matter. Mayor Linda Jeffrey was asked if she would call for a police probe into staffers who quietly used public revenues from taxpayers like their personal bank account between 2009 and 2014. The audit report focuses on a practice that became common among the city’s non-union staff called Outside Policy Requests (OPR). Senior staff devised the system of secret bonus payments to other non-union employees, and possibly to themselves. “This is at best serious negligence, and at worst corruption.” Mayor Linda JeffreyAccording to the audit report, city officials described OPRs as “discretionary salary increases determined by the operating department heads” that were “outside of council-approved policies” and documented procedures. In the neighbouring cities of Toronto and Vaughan spokespeople told The Guardian they do not have any such practices, nor had officials in those cities heard of such practices. The objective of OPR, according to previously undisclosed documents unearthed in the audit report, was to “align the salaries within the respective grades to achieve fairness and equity”. The audit also points out that the OPR payments to non-union staff could not be tracked because there was a “lack of coding”. For example, “favouritism” was eventually listed as one of the top 10 reasons to allow an OPR bonus, which the audit report points out is not in line with the previously stated reasons in internal documents. “The favouritism rationale is not condoned,” the city stated. The audit report zeros-in on the period between January 2009 and May 2014, which was given a code red designation (the highest possible call to action) from audit staffers recommending immediate action on addressing such policies. The report indicates that due to a “lack of coding” in the internal system these OPR transactions could not be identified. The report recommends that OPR be discontinued immediately, and acknowledges a sudden drop to almost no OPRs after 2014. The city stated that there was no OPR line item in the annual budget. It also noted that council approval for the OPRs was not sought. “Council approves the budget envelope for any given year and it is up to management to allocate expenditures for operations. OPRs were considered a part of this practice until their discontinuation in 2015,” according to a statement provided by the city. Asked if he would be recommending a criminal investigation, CAO Harry Schlange did not respond. “We are committed to the recommendations and action plans to strengthen our internal controls moving forward,” read a statement provided by the city. In addition to the $1.25 million paid out to staff without council’s approval, the woman who initially oversaw the audit investigation that uncovered what amounts to a taxpayer-funded slush fund, Catherine Spence, was let go by senior executives last year who could have been part of the OPR program. Spence, who was the head of the internal audit department, left the city while the probe into the undisclosed bonus payments was still underway. After Spence’s employment was terminated by the city early in 2016, while the audit investigation she was overseeing was still underway, the city’s new chief administrative officer, Schlange, took over as the city’s top bureaucrat in May 2016 — years after the bulk of the bonuses were paid and when the audit work that uncovered the secretive OPR program was already almost completed. In September, as part of a massive restructuring of senior staff, Schlange terminated many of the executives who, according to Friday’s report, had years earlier approved the $1.25 million in secretive bonus payments to non-union staff. It’s possible that some of those payments could have gone to the same senior executives who secretively approved them. The city told The Guardian it will not be citing specific individuals or the status of their employment. Deborah Dubenofsky held the city manager role during the bulk of the period identified, till the fall of 2012 when John Corbett replaced her. The Guardian asked Dubenofsky Monday morning (June 5) if she launched the OPR program and or approved the payments. She did not respond by end of day. Corbett was a member of Brampton’s senior leadership team for decades both as planning chief and then as CAO from 2012 up to the termination of his contract in 2015. Asked by The Guardian if he knew of the OPR practice, had approved it and whether he received such payments, Corbett said, “I’m really not equipped to answer that in time or verify it,” adding he has never heard the term Outside Policy Requests. The audit findings reveal HR management provided the city’s senior leadership and executive team a report dated May 21, 2014, which indicated that 230 Outside Policy Requests totalling $1.25 million were approved by the executive leadership team (ELT) between Jan. 1, 2009 and May 14, 2014. In addition to Corbett, the executive leadership team that ultimately approved such expenses in 2014 was made of Julian Patteson, chief public services officer, Marilyn Ball, planning chief, Peter Simmons, chief corporate services officer, and Dennis Cutajar, chief operating officer. The chiefs were among senior staffers terminated last year in a massive restructuring of the bureaucracy under Schlange who has repeatedly stated that positions were vacated strictly based on a need to restructure the organization and creating synergies while streamlining operations. The payouts happened during a period when several other questionable acts inside City Hall were identified, including abuses in discretionary expenses by councillors and the former mayor, hundreds of city contracts issued that violated policies and capital projects worth tens of millions of dollars that went unaccounted for. Senior staff, over the same period, also spent $175,000 of taxpayer money to buy tickets to former mayor Susan Fennell’s private fundraising events, without council knowledge. 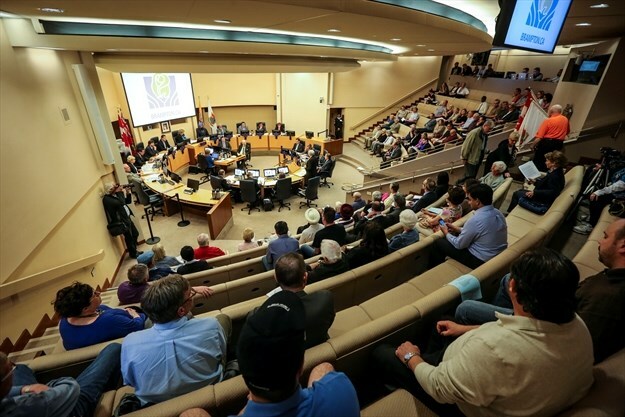 It is primarily up to council to scrutinize the non-union staff salary disclosures through the annual budget process meant to protect Brampton taxpayers. Two councillors who directly oversaw city budgets while the secret OPR policy was carried out were asked about the alarming report. Coun. Gael Miles faced criticism as budget chair for approving staff budget presentations with little council scrutiny, while budgets passed within days of staff presentations or even on the same day—unlike city councils in the GTA that take weeks or even months to approve staff presented budgets. Miles said Monday she is “very concerned” about the audit report, but could not provide any examples of specific concerns she raised about the OPR program. Jeffrey is renewing her call for outside oversight, which was recently rejected by some members of council. “This audit review was long overdue,” Jeffrey said. “This report demonstrates there is more work to do. In order to further strengthen the transparent, independent and third party oversight at City Hall I believe it would be wise to once again invite Mr. McCarter to conduct a follow-up audit,” said mayor Jeffrey, adding she will push for a full-time independent auditor general at city hall.